Finally, the long waited fight of Sam-A was announced. To many fans’ pleasant surprise, his fight was on a much bigger platform than originally expected. It was at ONE Championship; the largest combat sports in Asia, and its fights are broadcast in 128 countries around the world. Coach Sam-A fought in ONE Championship cage with 4 oz. MMA gloves under full Muay Thai rules inside the cage. His opponent was the WMC world champion. Coach Sam-A won the fight by TKO in the second round. After the fight, I sent a message to congratulate him and asked him whether he wants to continue to fight or retire. He expressed he wants to keep fighting if it’s possible. Looks like we would be able to see him in action in the future. Shortly after coach Sam-A’s fight, ONE Championship announced its launch of ONE Super Series, “a global super league that will feature the world’s greatest strikers from Muay Thai, kickboxing, taekwondo, karate, kung fu, Sanda, Lethwei, Silat, and more.” On the same announcement, ONE Championship announced two exciting fights for ONE: HEROES OF HONOR in Manila on April 20. 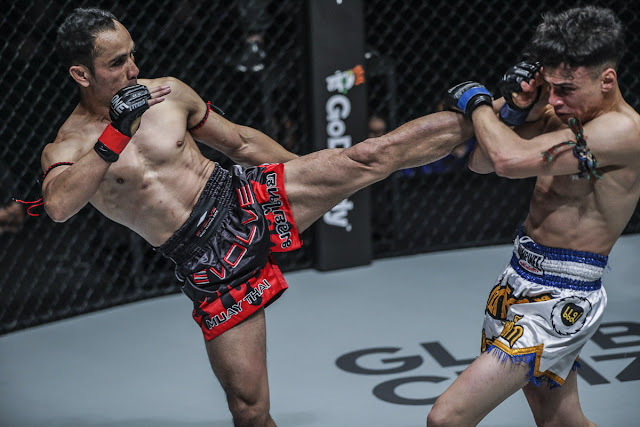 Multiple-time Muay Thai world champion Nong-O Gaiyanghadao (255-54-1) will compete against multiple-time Muay Thai world champion Fabio Pinca (99-23-4). Coach Nong-O is my first Muay Thai coach. He is considered one of the best Muay Thai fighters, if not the best, of his era. Fabio Pinca fought and won Muay Thai greats such as Saenchai and Sudsakorn Sor. Klinmee. Pinca was scheduled to fight Buwcau the end of last year. But, he had to withdraw from the fight due to an injury. Coach Nong-O hasn’t fought in the last three years. I am very excited about his return to the fight scene against a tough opponent like Pinca. Second great fight on the same card will be Legendary multiple-time world champion Giorgio Petroysan against Lion Fight world champion Jo Nattawut.